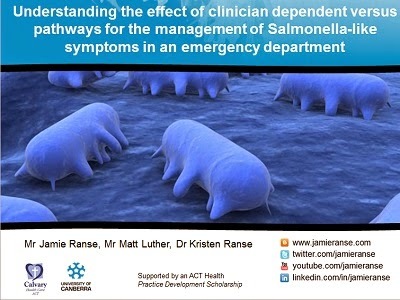 Understanding the effect of clinician dependent versus evidence-based pathway for the management of Salmonella-like symptoms in an emergency department. Introduction: On Monday the 13th of May 2013, a surge in patients with vomiting and diarrhoea presented to an Emergency Department (ED) in Canberra. Contract tracing identified a focal point between patients, and pathology samples identified Salmonella as the responsible agent. On the following Wednesday, upon a hospital based disaster being declared, a just-in-time evidence-based pathway was introduced to ensure consistency in patient management. This research aims to describe the effect of this pathway (intervention) versus clinician dependent (control) management of such patients. Method: This research was retrospective in design. The sample includes 110 patients who presented in May 2013 to one ED, with Salmonella-like symptoms. Data was collected from the Emergency Department Information System. Patient characteristics, such as age and gender are described using descriptive statistics. A Mann-Whitney test was used to compare continuous data and a Fisher exact test was used to compare categorical data, between the two groups. This research has ethics approval from the health care facility. Results: Over an eight day period, 110 patients presented with salmonella-like symptoms. Of these, 47 were male and 63 were female, with a median age of 30 years (IQR: 20-42). Both age (p=0.65) and gender (p=0.84) were statistically similar between the two groups. Overall, the mean length of stay in minutes (±SD) was 735 (1112). However, the mean length of stay in minutes was statistically different between the two groups, with the control being 975 (1280) and the intervention being 230 (251) (p=0.0001). Discussion: The length of stay for patients between the two groups was statistically significantly different, suggesting that the implementation of a just-in-time evidence-based pathway for the management of patients with Salmonella-like symptoms reduced the ED length of stay. This finding is useful in that it may assist in the future planning of similar public health emergencies or for use when patients present with Salmonella-like symptoms on a daily basis.